There is one thing that I’m certain of today—life is full of the unexpected. Difficulty causing hardship often comes in hours when we are least prepared, taking us entirely by surprise. In the pitch dark of the night, these Christ-followers faced horrific winds and waves that caught them off guard. They had been with Jesus and had been part of mighty miracles that confirmed the kingdom that the Lord proclaimed by his words and his actions. Being handpicked and trained by Jesus, they felt that they had advanced to the pinnacle of spiritual maturity. The ferocious headwind came when they least expected their faith in Christ to be severely tested. As their vulnerable, handmade-wooden vessel recklessly tosses to and fro, rising and waning with each enormous wave, these followers of Jesus are overwhelmed by a deadly mixture of fear and doubt. 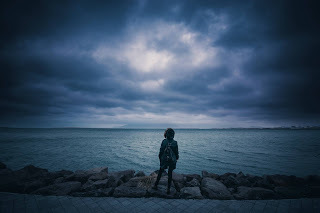 Their individual responses likely mimic the ones I suggest earlier and are similar to how we have responded to the storms that come into our lives, threatening to wreck us and work havoc on our well-being. The last thing on their mind is the fact that Jesus is nearby and watching over them. “But the boat by this time was a long way from the land, beaten by the waves, for the wind was against them. And in the fourth watch of the night he came to them, walking on the sea. But when the disciples saw him walking on the sea, they were terrified, and said, ‘It is a ghost!’ and they cried out in fear. But immediately Jesus spoke to them, saying, ‘Take heart; it is I. Do not be afraid’” (Matthew 14:24-27 ESV). Please know that it was in the darkest hour that Jesus came to them. He loved them so much that there was never any question of whether or not he would rescue them. The hardest part for Jesus was waiting until the darkest hour, at the peak of their storm, to come to them. However, waited, he did. These Christ-followers were caught up in their current crisis, and they failed to recognize Jesus coming to their rescue. The thought of Jesus being close to them and caring for them did not enter their mind, but Jesus still came to them. He came to them in the height of their paralyzing fear and the depth of their debilitating doubt. Jesus came to them saying, “Don’t be afraid! I am.” God revealed himself to Moses in Exodus chapter three as the “I am.” He had heard the cry of the Israelites during their storm of slavery as they labored at the hand of an abusive master. He saw their hardship, and he sent a deliverer to rescue them. God loves us so much that he has sent Jesus to do the same for us. Jesus speaks to us today, "Don't be afraid! I am." He is our Deliverer! Beloved, Jesus is close to you right now. He has not left you, and he will not allow you to be destroyed. No, he never leaves you; he is always nearby, watching over you. He delivered you before, and he will again. At the right time, Jesus will draw near to you and once again reveal himself as your deliverer. You can rest assured, knowing that he is greater than your crises. Don’t be afraid; the great “I am” is with you.